My name is Kurt Morrison and I’m an ACMG guide and climbing gear junkie based out of Canmore, Alberta, Canada. Working in gear shops for the past four years while completing my exams to become a mountain guide has given me the opportunity to test a lot of different gear. I’ve learned what I like, what I don’t and why. While this is an ever-evolving endeavor, I believe I would be doing a disservice to my guiding clients who ask for gear advice or to the customers at the shop had I not adequately experimented with the products they’re inquiring about. Through the years of staff discounts, pro-deals and prototype testing for companies I’ve amassed a sizable collection of gear. Most of it I use but some of it I don’t. I believe it is extremely important to have the ability to select the correct tool for the job at hand, particularly in a high-risk activity like climbing. Below I’ve outlined what I currently have in my gear closet. This excludes my girlfriend’s stuff, guiding equipment, old gear that is past its practical lifespan, and gear that is stashed at projects. There is a brief explanation for its inclusion in my collection. Edelrid Flycatcher 6.9mm Twins 60m – For straightforward ice and alpine routes where every gram matters. On icy north faces or long waterfall ice climbs, these are my first choice. Note: Edelrid no longer makes the Flycatcher. Edelrid Skimmer 7.1mm Halves 70m – I typically reserve these super thin halves for routes where I don’t want to carry the extra weight. Long, complicated ice and mixed routes, particularly when linking pitches is possible. It should be noted that both the Skimmers and the Flycatchers are so thin they require a special belay device that can handle such small rope diameters so I have three Edelrid Micro Jul’s as I can’t expect every partner to have this niche device to use my speciality ropes. Petzl Salsa 8.2mm Halves 60m – Utility half ropes. I use these larger diameter halves when mixed climbing or for wandering alpine rock routes. When they get older they’ll be relegated to summer rock routes. Edelrid Swift 8.9mm Triple 60m – My favorite rope and my first choice for ice. The triple rating allows for lots of different options in protection strategies, particularly with two seconds and the weight is appreciated on long approaches. I’ll often pair this with a thin tagline for full length raps. Sterling Aero Bi-Colour 9.2mm Triple 70m – For all the same reasons as the Edelrid Swift but I opted for the 70m and duodess weave for situations where I’m only bringing a single rope. Petzl Volta 9.2mm Triple 60m – Used when trying to save a bit of weight for harder projects or alpine rock. Edelrid Boa 9.8mm 70m – Used mostly for single pitch climbing. I’ve had this for a while and it still handles like a dream. Edelrid 150th Anniversary Bi-Colour 60m – I prefer a 60m for multipitch rock, paired with a tagline if the rap calls for it. Edelrid 6mm Rap Line 60m – I didn’t spring for the Rap Line II that’s rated for two twin falls but this stuff is rated to 20kN and my 60m only weighs 1.5kg. In retrospect I should have got a 70m to accommodate rope stretch from dynamic ropes but I’m still very happy with this setup. Note: This original Rap Line is no longer produced. 40m Work Ropes – Most of these are thicker and salvaged from older, full length ropes that have needed chopping. I use them for courses, short sport crags and occasionally for minimal sections of short-roping on scrambles. Petzl Spirit Express – In my humble opinion these are the best sport climbing draws ever made. They’re light, easy to handle, easy to clip on both bolts and ropes and wear extremely well. I have sixteen of the 12cm draws and while there is times that I could have benefited from longer draws, these have served me well. I’ve outfitted two draws with the longest dogbone and a DMM Revolver and use these to reduce rope drag or when I’m projecting a route and frequently falling on the same draw to reduce wear in the rope. Edelrid Ohm – I guess this is technically a sport draw. Edelrid sent me one a while back to test and I’ve been really impressed with the simplicity and effectiveness of this solution and recommend it for anyone who climbs with partners of a large weight differential. Note: Far more details of the Ohm have been written here. Petzl Finesse (with Large Ange’s) – The Petzl Ange is my favorite carabiner for winter use. I prefer wire gates for ice to prevent icing up and a smooth, notchless nose is a non-negotiable for me. I love the weight of these and also appreciate that the shape allows for clipping through even the most awkward, ancient angle pitons. Petzl Ange Alpine – For all the aforementioned reasons but for alpine draws the smooth nose becomes even more important to prevent snagging while extending. 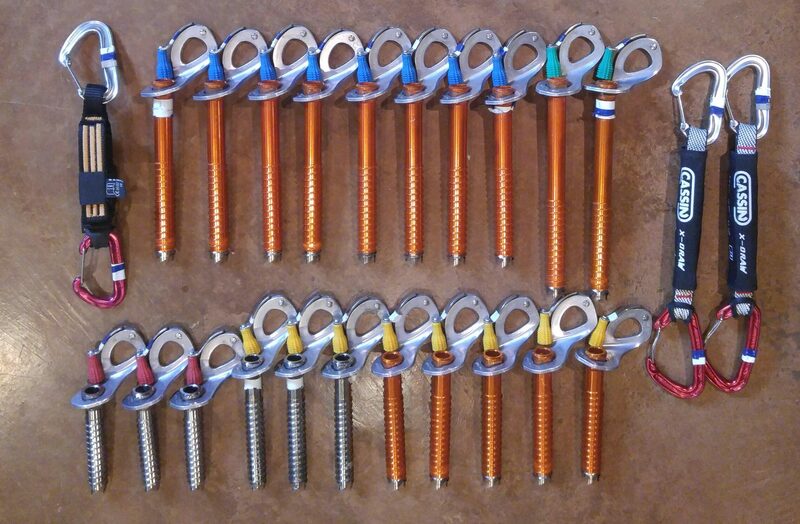 Note: These were made using Ange S and Ange L carabiners with BD Runners, Petzl doesn’t make/sell Ange Alpine Draws. Edelrid Pure Quickdraws – For summer rock climbing I like a solid gate for the durability and I’m really fond of the shape of these carabiners. They aren’t the lightest so I consider these part of my “utility rack” that I don’t mind using hard. I made them using Black Diamond Dynex dogbones because I really liked the size of the loop on the gear end. It allows for a lot of rope movement before unseating a nut or causing a cam to walk. I also add a couple of Pure carabiners on shoulder length slings to quickly extend a cam placement without having to carry an extra carabiner on an alpine draw or fumble with the unclipping. Edelrid Nineteen G Quickdraws – For fast and light alpine missions where every gram matters. I have a small rack of them and also keep a few free biners for anchors or on slings for extending pieces. A lot of people find these two small to operate but I’ve only had an issue if I was wearing really big gloves. After a little bit of practice they’re very easy to operate, even with using double ropes. 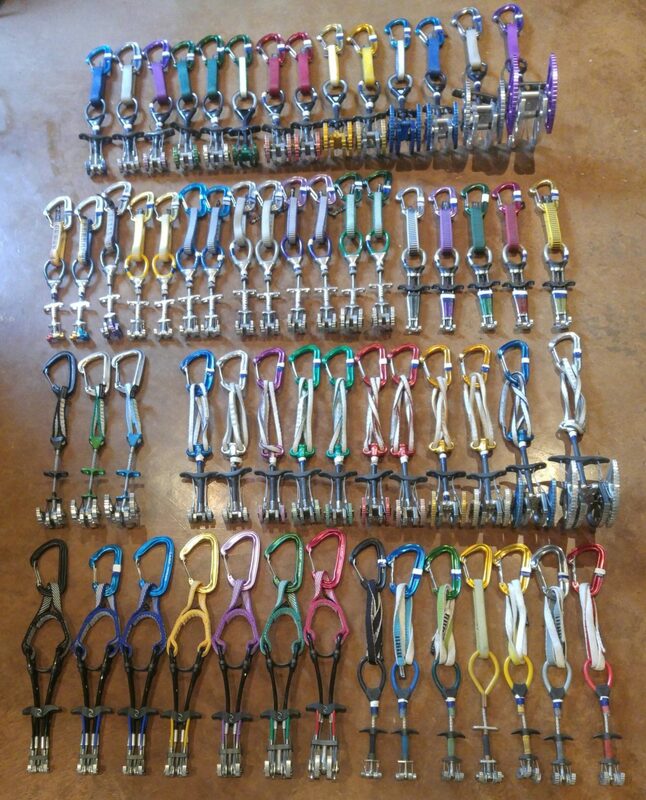 I also take these along If I’m climbing with two seconds and want to keep the ropes separated. DMM Dragons – The Dragon Cam (mix of Gen 1 and Gen 2) are the bread and butter of my rack. The holding power is fantastic and the quality and durability is second to none. The extendible sling also provides a lot of options. While I climb primarily limestone and quartzite, these are hands down my favourites for any time I’m on granite. Totem Cams – The more I use these the more I believe they’re the cam of the future. The direct lobe loading system instantly feels better than a conventional cam and the small placements are very confidence inspiring. I foresee myself buying a lot more of these. Fixe Aliens – Mix of Evo’s and Revo’s. I prefer the flexible stem and softer metal lobes for limestone climbing. Also, for the equivalent range, I can carry six Aliens (Black 1/3 – Red 1) for less weight than fix X4’s (Red 0.1- Purple 0.5). Most of mine have extendible slings, a feature which I rarely use as I’ll usually still extend with sling but I’ve found the extension for both the Aliens and the Dragons very helpful whist building gear anchors. Black Diamond X4’s – These were my first micro-cams and I built up to a double rack from 0.2-0.75 with a few offsets. Over time I found the 0.5 and 0.75 (purple and green) to be a little floppy due to head weight and rarely pack them. I do love the set for areas with lots of smooth, horizontal cracks (Back-Of-The-Lake, Lake Louise or The Gunks). I’ve never owned the red as the smooth lobes and diminutive stature freak me out a little bit. Black Diamond C3’s – These fit finicky, odd shaped features better than most and I love them for horizontal cracks and corner slab climbs. When well-placed the amount of metal contact with the rock is awesome. Black Diamond Ultralights – There is no disputing the weight savings and these are great for alpine rock. I prefer the larger sizes. I consider these a specialty tool and typically reserve them for routes that are heavily gear intensive or require long approaches. I’m very quick to grab these if I have to double up a rack! I don’t use these on a daily basis as they’re expensive and I’m trying not to wear them out prematurely. Metolius Ultralight Mastercams – I have a few that I’ve been demoing and while I really like the weight and the action I don’t use them often enough to warrant a new colour scheme to learn. For non-lockers, I’ve gradually been making the switch to lighter, smooth-nosed carabiners wherever possible. My DMM Dragons are racked on the DMM Chimera and I have a pile of these for rock climbing as well. The majority of my other cams are racked on CAMP Nano 22’s but I still have a residual pile of Nano 23’s, Black Diamond Oz and Neutrinos and assorted booty biners. DMM Wallnuts – My favourite stoppers. I love the shape, the different metal compounds and the overlap in sizing. I have a set of the older style kicking around somewhere that had solid sides, making them ideal for tapping into icy cracks. DMM Alloy Offsets – When I picked up a set of these I started noticing offset placements nearly everywhere and DMM Peenuts for the reasons listed above only smaller. Wild Country Anodized Rocks – I learned on an old set of these prior to the anodizing and have grown accustomed to the shape. I loved the old version and the new ones are even better. Mixed in are a couple of the Superlights and I wish these were more readily available as I’ve bailed off a few and have not been able to replace them. DMM Brass Offsets – Quartzite seems to eat these up. I bring a few of the smaller sizes to compliment my bigger stoppers. I love that the colour scheme stays consistent between these, the Peenuts and the Wallnuts. RPs – I’ve found the blocky shape cumbersome to place and usually reach for the DMM Brassies but, come’on, they’re a classic! A couple of ancient SMC stoppers round out this collection. Wild Country Hexentrics – There’s nothing quite as comforting as a well placed hex. Great for alpine climbing when hammered into icy cracks and cheap to leave behind. I like the larger ones to supplement a rack of cams. C.A.M.P. Tricam Evo’s – People either love them or hate them. I’m in the school of the former. I really like them for gear anchors as they weight next to nothing, fit where nothing else will and you can slide them deeper into a crack to tension a leg of your anchor to improve equalization. For this reason I love them as an upward pull piece. They aren’t overly difficult to clean at a station, but for the sake of my second, I try not to place them on lead. The black and the pink get the most use. Progress Capture Devices – I’ve messed around with them all and currently have a pile of different Wild Country Ropeman’s, couple Microtraxions, a Petzl ascender, couple of Tiblocs, and a pile of different pulleys, from which I’ll customize my rack for the objective. Lately I’ve become a big fan of the Petzl SM’D screw lock carabiner with a small hole for threading with cord and attaching to a small ascender. I’ve been racking a Tibloc and a Petzl Oscillante pulley for a lightweight rescue kit. Aside, if you’re curious about using progress capture pulleys in hauling systems, check out this post about how to Haul for Hard Multi-pitch Climbs. Personal Anchor Slings – I’ve tried a few over the years and firmly believe the only one worth owning is the Petzl Connect Adjust. I’ve been using the Dual Connect when I know I’ll be dealing with hanging belay stations as it has the second extension arm for a rappel device but if I had to repurchase I would get the single armed variety. Pitons – I’ll occasionally bring along a couple for alpine climbs and have found medium length knifeblades and baby angles to be most useful. For winter mixed climbing the larger sizes of beaks seem to find their way onto my harness more and more. I rack four or five on a wiregate oval carabiner. Spectre hooks could be included here and they see occasional use on alpine climbs. Aid – I haven’t done a ton of aid but have a collection of hooks, beaks and pins, daisy chains, Metolius Pocket Aiders and ascenders to play with while I refine the skills. Also included in this pile is a few accessories for hand drilling bolts and some various other hardware. I’ve battle tested quite a few belay devices but usually gravitate back to the same ones. Petzl Reverso for ice due to its lightweight nature and ability to handle smaller rope diameters. DMM Pivot for multi-pitch rock where I’m more likely to need to lower someone. BD ATC Guide for cragging because it likes fatter ropes and is very durable. Edelrid Mega / Micro Jul for alpine. Each of my belay devices live with a full stock carabiner like the old Petzl Hera and a small asymmetrical D for multi pitching — my favourite being the DMM Phantom. The obvious industry standard for sport is the Petzl GriGri (of which I have the 1, the 2, the 25th Anniversary and the Plus) but I enjoyed the Trango Vergo until the recall and am looking forward to the replacement. My favourite lockers are the Petzl Attache and I try to keep them organized to monitor the wear. I used the blue Hera’s (new style) for ice and the orange Attache 3D for alpine and mountaineering. For trad and multipitch I like the Edelrid Strike because you can usually find them for a good price and the thicker top stock wears well with dusty ropes and repetitive summer abuse. For sport climbing I grab whenever I have on the locker peg in the gear room, which is usually a few old Black Diamond Rocklocks and that have a completely round stock and a couple of Positrons for building anchors. I often use the Petzl SM’D for the weight savings and enjoy having a carabiner with a large enough basket to allow a munter to roll. I have a bunch of D-shaped kicking around but usually opt for HMS/pear shaped because of their versatility. Petzl Lynx – I have two pairs of these that I abuse pretty hard and they keep on trucking. Great crampons. One is equipped with toe bails, the other with straps based on the boot selection. Petzl Dart and Grivel G20 – Mainly for mixed and dry tooling. I go back and forth between these two but I prefer the G20s on funky ice because the little secondary point adds stability. I have two pairs of these. Grivel G22 – Fixed dual points. I like these for pure ice routes when I want to save some weight. Cassin Alpinist Pro – I’m currently demoing these hybrid crampons from Cassin and so far they’ve been great. I suspect they might be my new go-to for alpine ice climbing. They feel bombproof and fit great on any boot I’ve tried. Cassin Alpinist – I haven’t spent a lot of days on these yet but they’re on pace to be my new favourite mountaineering crampon. I love how they fit and the support they offer in soft snow. Black Diamond Sabertooth Pro – These climb pure ice routes better than any horizontal front point crampons I’ve tried before and I owe that to the orientation of the secondary points, which engage better and quicker than most. I like these on warmer days in the spring when the ice is getting softer. Petzl Vasak and Irvis – My slow uphill walking crampons. Twelve point Vaseks for technical mountaineering crampons and alpine ice and the Irvis for general mountain travel. Petzl Leopards Leverlock Fil – These are the lightest crampons out there right now (see WeighMyRack’s crampon page for the exact list). They fold down to nothing because of the dyneema cord and weight the same as four Cliff bars. I don’t let them see rock travel but for Bugaboo glacier approaches, ski mountaineering or emergency use they are unbeatable. It should be noted that its only $26 for a new length of the dyneema cord and you can swap out the front segment and make your own hybrid crampons. Petzl Nomics 2018 – I just got my hands on a pair from Petzl and put them through a pretty intense demo. I was really impressed with the slight changes to the time-tested model. Note: As this post is released, the Petzl Nomics will still not be available for sale for a number of months. Petzl Nomics – With the Pur’Ice pick these are unbeatable on waterfall ice. Cassin X-Dreams – With the Mixed picks I used these for dry tooling, cragging and mixed climbing. I love the huge pommel for hanging on steep stuff. Petzl Quarks – I have three of these because I found a smokin deal on a single. I use two hammers for alpine climbing and occasionally bring a striped down adze for mountaineering. Cassin X-All Mountain – Great tools for the same purpose as the Quarks but I rarely use them. Grivel Nepal S.A – This was my first piolet and it has survived 100+ days in the mountains without showing any wear. It isn’t the lightest but it’s a workhorse. Petzl Ride – 240g and fits inside an 18L pack. If you ever have the debate as to whether or not to bring a piolet for ski mountaineering, approaches, scrambles or mountaineering, this tool should make it a no-brainer. For me there is really only one viable option for ice protection: Petzl Laser Speeds. I’ve tried the others and promptly sold them, including a rack of Black Diamond Express Turbo this week. Nothing starts as easily as the Petzl screws and they’ve served me well for a long time now. I prefer the aluminum Laser Speed Lights for harder climbs and favour the 13cm variety. I included a few load-limiter slings in this collect as ice climbing is really the only time I consider them. They usually accompany the 10cm stubbies. Black Diamond Mission 75 – A big, simple haul-all for Bugaboo trips or ski traverses. Black Diamond Speed 40 – Simple and light, but durability is suspect. I use this for a lot of rock climb approaches. Gregory Alpinisto 35 – Very comfortable pack but a tad heavy. I like this for ice climbing approaches but I’d rather not climb with it. Patagonia Ascensionist 30L – I think this pack is damn near perfect. I love the size, weight, double drawstring closure and how it carries. I love climbing with this on my back. MEC Alpinelite – I have these in 26L and 18L and they’ve seen tons of use. I like this design more than the new version and have gotten a lot of use from the 26L because of the crampon straps. The 18L rolls down into a small package and I’ll often use it as a climbing pack for my thermos and puffy on ice. DMM Zenith 18L – As a multipitch climbing pack, this thing rocks. Climbs like a dream, well constructed and thoughtfully designed. Salewa Mountain Trainer Mix – Light mountaineering, scrambling and approaches. Scarpa Triolet – My three season workhorse. Over the last five years this boot has taken me to four country high-points and above 4000m more than twenty times on several hundred days of climbing. Scarpa Rebel Ice – For dry tooling. Currently equipped with Krukonogi crampons and front points. Scarpa Mont Blanc Pro GTX – I don’t find these particularly warm so I use them for alpine climbing, fairweather mixed climbing and dry tooling. The front bail attachment is really narrow so I equip a few crampons with Black Diamond narrow toe bails if I plan to use these. La Sportiva Trango Ice Cube – Slightly warmer than the Mont Blancs but the fit doesn’t agree with my feet so these rarely get used. I find them snug in the forefoot and as I tend to run cold, I usually reach for a warmer boot. That said, they are unbeatable on techy mixed climbs. La Sportiva Nepal Cube – My general mountaineering boots. I use these on glaciers in the summer and for early season ice when the approaches are on rocky terrain. I love the relaxed fit of these for long days in the mountains. Scarpa Phantom Techs – This boot is incredible. Warm, light and comfortable. I wear it 90% of the winter but avoid rocky terrain, as the orange Morflex soles wear down pretty quickly. Arc’teryx Acrux AR – Slightly warmer than the Phantom Techs, not quite as warm as a true double boot but crazy comfortable. I’ve never had a wet foot wearing these and really like them for cold alpine climbing. Scarpa Phantom 6000 – My cold weather ice climbing boots. Even through I usually run cold I’ve had these down to -37C (-34.6 F) while ice climbing in a down parka and puffy pants but never had cold feet. For all the same reasons as the Phantom Tech, I limit the use on these to snow and ice and always with crampons. I sized them large for altitude. La Sportiva TC Pro or Evolv Astroman for granite Note: The Astroman just retired but you can still find some models around, with great sale prices. Evolv replaced it with The General which is coming out very soon. I often buy the same shoes in different sizes based on the anticipated duration and performance required. I didn’t include a picture assuming no one would be interested in seeing my dirty shoes. Arc’teryx AR395 – Ice and alpine. The clipper slots are exactly where I want them and it is very comfortable. I like the adjustable leg loops for varying layers. I use four DMM Vault clippers and couldn’t be happier with them. Arc’teryx R300 – Fixed leg loops and light. I like this one for sport climbing. Note: The R300 isn’t produced anymore, the SL340 is new fixed leg option. Edelrid Jay II – This harness is surprisingly comfortable and durable. The gear loops are well positioned, spacious and sit well under a pack. I like this one for general trad climbing, knowing that I’m not prematurely wearing out a harness three times the price. Petzl Altitude – Although this is designed as a ski mountaineering and glacier travel harness Ive been using it as an alpine climbing harness lately if the route is not too gear intensive. It moves well, is comfortable(ish) to hang in and packs down to nothing, often letting me size down my pack for the day. I have a Black Diamond Couloir as well but since getting the Altitude, I’ll never use it again. Petzl Meteor – I like the shell and the lightweight for ice climbing . Very comfortable and sits well under most hoods. I have an orange one sized for summer sport climbing and a blue one sized to fit over a hat in the winter. Petzl Sirocco – While I don’t plan to win any beauty competitions with this thing on, it’s light, durable and confidence inspiring. I use it for alpine and occasionally skimo. Note: The newer Sirocco’s, seen via the link, look much nicer. Black Diamond Vapor – This breaths like no other so I reach for it on hot summer days and any time I plan to work hard. Black Diamond Half Dome – Certain crags that are prone to falling rocks necessitates a hardshell and this cheap one has lasted me years. Occasionally I’ll also use my smaller-sized orange Meteor for sport too. Black Diamond Vector – My girlfriend’s helmet was included because it was hanging in the living room already. This Gear Stash post is Part 2 of 11 and is sponsored by Backcountry. This means, all opinions are 100% the author’s and there has been no manipulation of the gear being displayed, but gear links go directly to Backcountry’s website when available. This sponsorship helps to keep WeighMyRack alive, to pay authors, and allows more articles to be written. Also, since Backcountry has the biggest online selection of climbing gear of any US retailer, it made sense for us to partner with them for our Gear Stash stories. Kurt Morrison is a former banker turned ACMG guide, adventurer and stuntman based out of Canmore, Alberta. He is an avid gear tester and you can read his reviews at kurtmorrison.ca or find him on Instagram.